Photo of 2017 Sentra SR Turbo courtesy of Nissan. 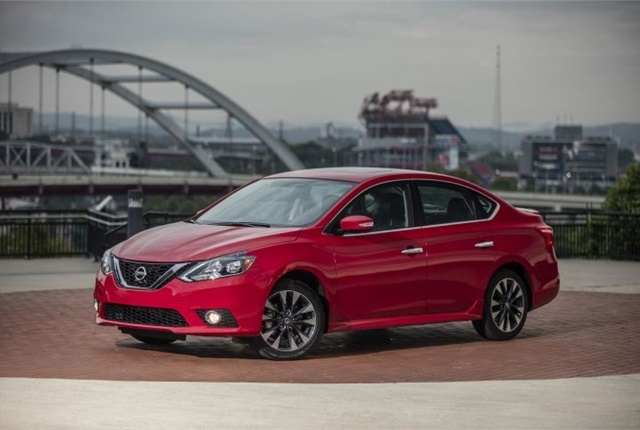 Nissan's base model 2017 Sentra will retail for $18,825, which represents a $360 increase from the outgoing model, NIssan has announced. Nissan is adding the SR turbo model for 2017. The Sentra S equipped with a 1.8L inline-four with the Xtronic CVT retails for $18,825. A lower-cost Sentra S with a 6-speed manual transmission will retail for a $1,000 discount. Other Sentra models will sell for $19,625 for the SV with 1.8L and Xtronic, $20,825 for the SR with 1.8L and Xtronic, $22,335 for the SL with 1.8L and Xtronic, $22,825 for the SR Turbo with the direct-injected 1.6L and 6-speed manual, and $22,825 for the SR Turbo with the 1.6L and Xtronic.